Tiruvathirai in Tamil culture is observed on the day when Lord Shiva performed the Tandava. The festival is also a commemoration of Shiva’s Nakshatra (Birthday Star) Ardra. Thus the festival is popularly known as Arudhara Darshanam. serpent on whose body Lord Vishnu lays down). The subjects of Lord Shiva also witnessed this dance. wanted to seek the grace of the Lord for protecting the cosmos with his grace. darshan to Kamadhenu (the divine cow of plenty) on this day. It is more of a women’s festival with women emulating Goddess Parvati, who tries to get Shiva as her husband. Observing Thiruvathira vratham ( Nonbu, as it was called ) would bring long life to the husband and prosperity and good life to the family. Thiruvathira Nombu is observed by Amma and Athai every year and I do too. 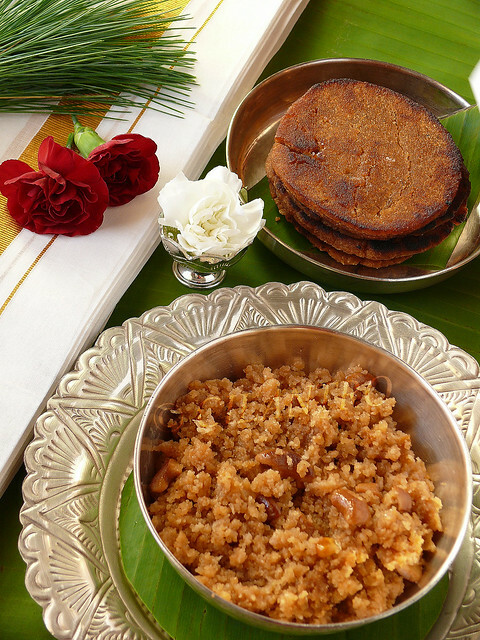 Thiruvathirai Adai, Kali and Ezhukari Kuzhambu are made and offered to God. In 2012, the date of Thiruvathirai Festival was on January 8th. 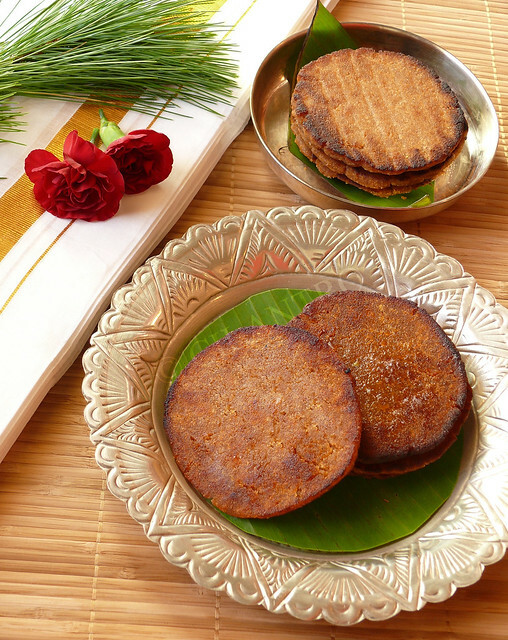 I could not post the recipes ahead of the Nombu but I took pictures while I made them and here are the recipes below for both the Adai and Kali. Dry roast the grated coconut until the hissing noise goes. Transfer immediately to a plate to cool. In a pan bring water to a boil and add the jaggery. Let it dissolve. Strain if necessary to remove any impurities. Now add the rice flour, roasted grated coconut and cardamom powder. Stir well until it forms like a halwa consistency like shown in the picture. Switch off the flame. This should take 2 to 3 minutes. Apply some ghee to a thick Ziploc bag or a banana leaf. Make big lemon sized balls and flatten to a thick round shape as shown. Heat a tablespoon of ghee in a pan on medium heat. ( Do not cook the Adais in high or low heat. 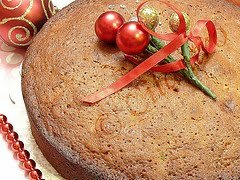 Always maintain medium heat to ensure it does not break and it is made to a nice brown color and the flour is cooked inside well). After 2 minutes turn over to the other side and add ghee around the Adai. Remove slowly after 2 minutes. The rice flour is made fresh on the day of the Nombu. I soaked about 4 cups raw rice and got 3 cups fine rice flour and 1 cup coarse rice flour. 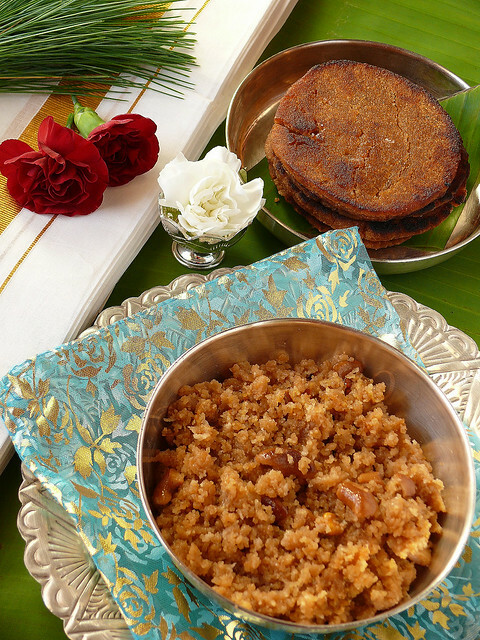 Ghee is used in this recipe and no oil is used. Fresh grated coconut is used and roasted so that it lasts for a day or two. The flour is stirred well to make a halwa consistency and when the ball is rolled it has to form a smooth ball with no cracks. When you roll the first one and notice that the dough is little thick and cracks are formed then sprinkle some warm water to the dough to make it little smooth. Do not turn the Adais too often since they tend to break. Turn it just once. Typically 7 Adais are offered. The Adais are made delicately to ensure it should not break and the perfect ones are offered to God. Heat 2 tablespoon ghee and roast cashew to a nice brown color. Now add the grated coconut to the ghee, mix well for few seconds and set Aside. In the same pan bring water to boil and add the rice flour. Mix well and immediately bring it to low flame and cook covered until all the water is absorbed. Now add the jaggery and combine well.Keep stirring until Halwa consistency. Then add cardamom powder, remaining ghee, cashews and coconut. I have used the coarse rice flour that was retained in the sieve while Sieving the rice flour for Adai. I soaked about 4 cups raw rice and got 3 cups fine rice flour and 1 cup coarse rice flour. 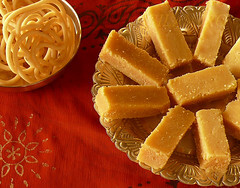 Adjust the jaggery according to your taste. Raisins can also be roasted with cashew and added to the kali. Oh I love this Kali.Its one of my favorites.I make sure that I Mom makes this whenever I go Home. 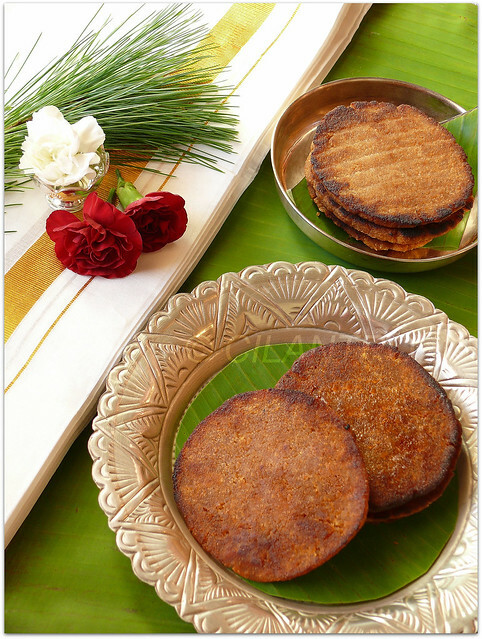 Delicious adai n tempting clicks..dear!! do drop by my space n I would love if you follow my space too..
Nice presentation on the recipes. Very traditional. Looks so good. YUM! Wow, such stunning clicks. Loved every one of them. I love the kali with kootu. Brings back nostalgic memory and I am missing home now. Such a beautiful traditional food styling! I never ate this but I think i am gonna love it. I love your way of step wise pictures. Beautiful pictures. First time here and your blog inspires me...all ur pics r amazing and lovely recipes and posts. Will be checking out more here. DO visit my space when u get the time! Very nice space. First time here and am happy to follow you.. I think it is on Dec 18th for 2013 but I will confirm later.